Would you visit these graveyards at night? These creepy cemetery photos are sure to give you the chills. 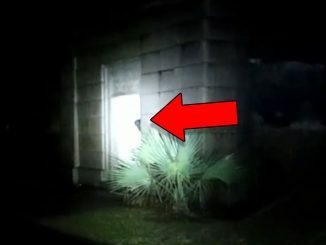 From a ghost girl caught on Google Street View to an alleged vampire seen walking among tombs, these creepy cemetery photos are believed to show paranormal activity. 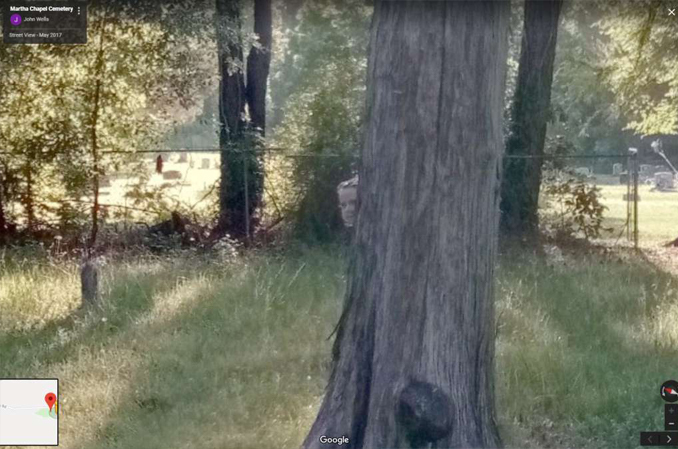 A terrifying image has been spotted on Google Maps and it’s freaking the Internet out. The picture was discovered by Youtuber The Hidden Underbelly 2.0, while exploring Google Street View. It’s taken on the grounds of the Martha Chapel Cemetery in Hunstville, Texas. In the photo, you can clearly see a child’s face peering out from behind a tree. What’s particularly eerie, is that the child appears to have grey skin and sunken, blank eyes. Viewers have been quick to call this child a ghost, and even pointed out that there appears to be another strange figure in the image. Some bold claims are even saying it’s the Grim Reaper, coming to collect the child’s soul who has been left to wander the graveyard. While the black figure seems to be a bit of stretch, probably even just a leaf on the tree, the child’s grey, ghostly face is undeniable. Locals have said that that the cemetery has a long history of being haunted. Built in the 1830’s, the Martha Chapel Cemetery is one of the oldest burial grounds in Walker County, East Texas. Reports of screams and howling are not uncommon for the area. Some have said they’ve seen strange lights hovering among the old gravestones. Locals refer to it as ‘demons road’ because of the strange sightings and inexplicable feelings of dread that wash over anyone who visits. One tourist even reported large handprints that appeared on their car windows when they stopped for a look. Could Google Street View have inadvertently captured proof that this old cemetery is indeed haunted? 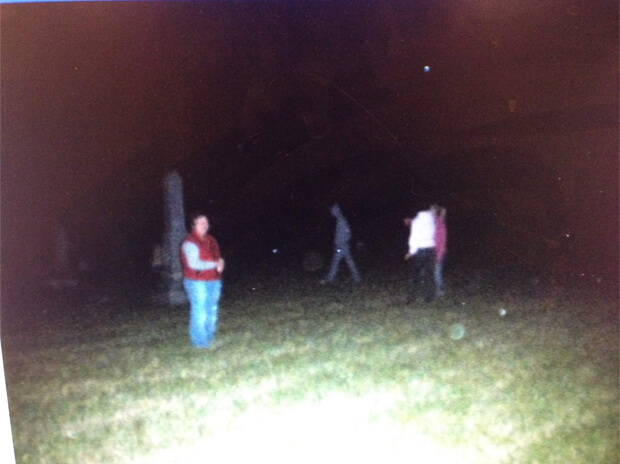 This eerie photo is said to have been taken in the old Union Cemetery in Central Illinois. Experts claim that the strange cloud in the left hand corner of the image is proof of paranormal activity. The old Union Cemetery was built in 1831 and closed down around one hundred years later when fire destroyed the Union Christian Church that sat at the edge of the grounds. Since then, the forest has enclosed around the graveyard and it can no longer be seen from passing roads. The cemetery has been notorious for supernatural occurrences. Locals have reported all kinds of strange things, including dramatic drops in temperature when walking through the property. The sheriff’s deputy and two caretakers independently said that they had seen strange balls of light floating among the tombstones. They also reported feelings of dread and anxiety when visiting a certain area of the cemetery. A local paranormal investigation team spent several days at the sight looking for signs of the supernatural. They discovered unusual fluctuations in the area’s electromagnetic field and cited temperature drops of more than 40 degrees Fahrenheit. 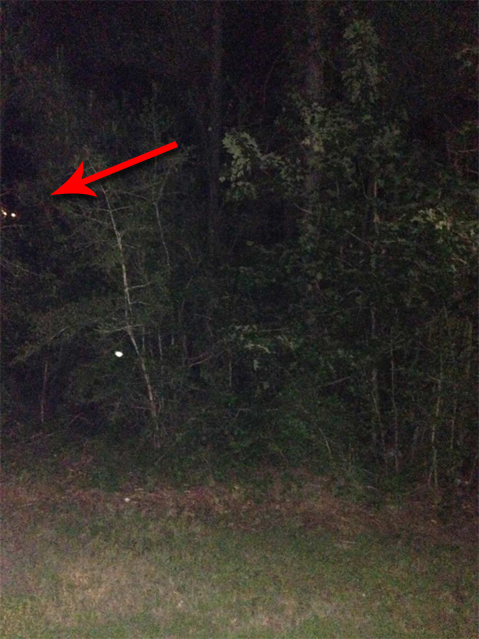 Could this photo prove the strange happenings at the old Union Cemetery? 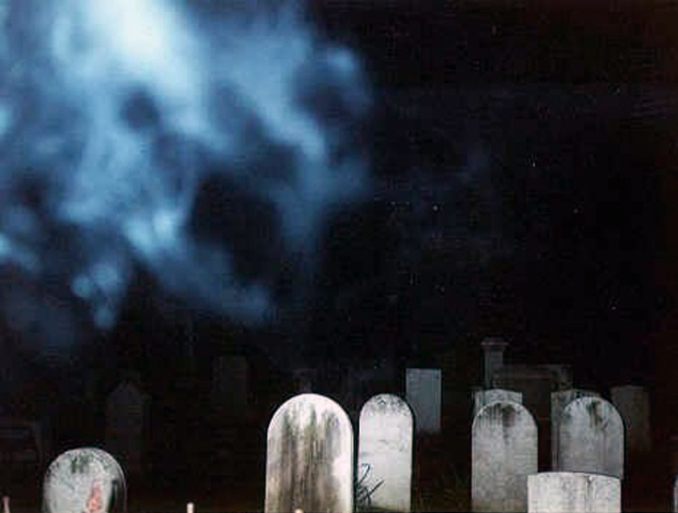 Is the strange shape in the corner of the image a spirit making contact from beyond the grave? This is one of the most famous ghost photos ever taken. Snapped in the early 1940’s in Queensland, Australia, this eerie cemetery photo has continued to stump experts. The photographer, known only as Mrs. Andrews, was visiting the gravesite of her daughter who passed away when she was just 17. She took a number of photos that day and was shocked when they were finally developed. 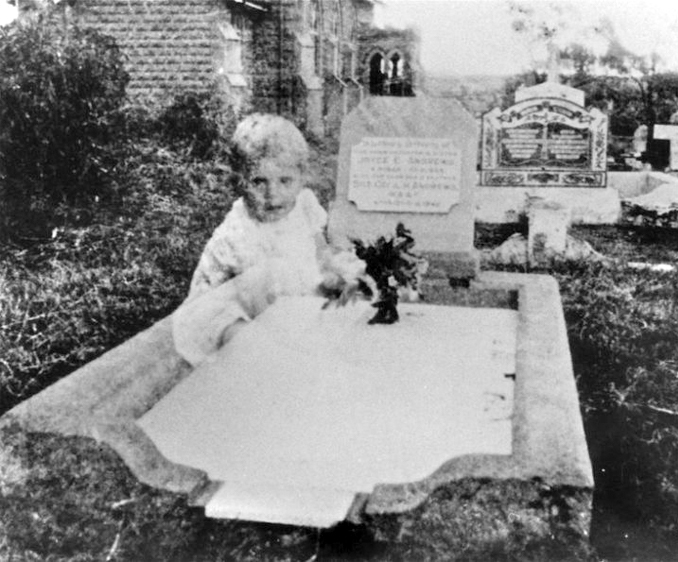 In the picture you can see what many have called over the years the ghost of an infant, sitting beside the grave. 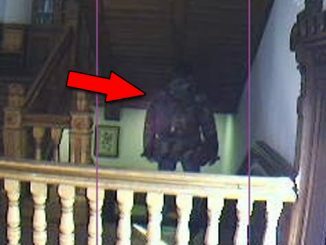 The figure is very clear and somewhat translucent as it stares directly at the camera. Mrs Andrews was unable to identify the young child and didn’t believe it to be the spirit of her deceased daughter. The image quickly became famous, with many news outlets running stories on the ghostly photo. 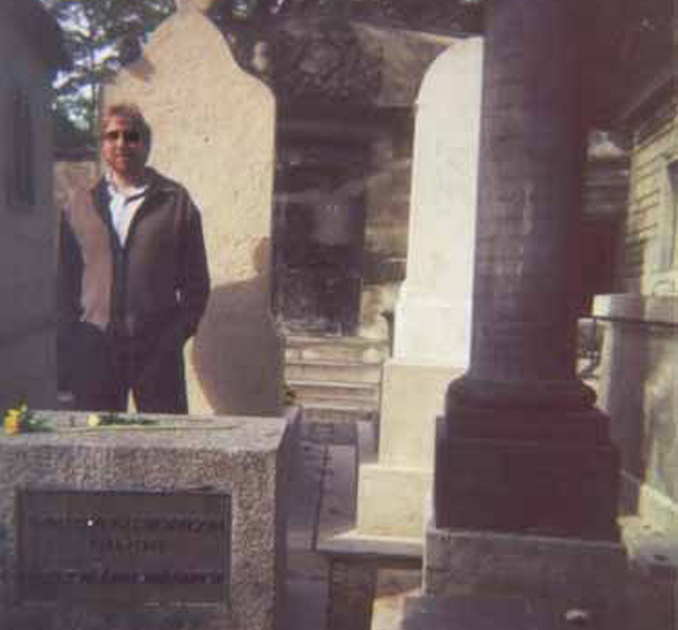 Eventually a paranormal investigation team looked into the picture and the cemetery it was taken in. They discovered that nearby to where the photo was taken were the graves of two infant girls. 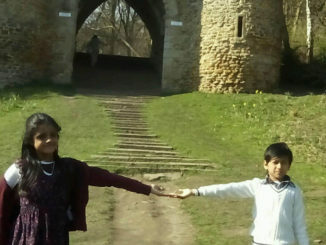 The investigators suggested that this photo has captured the ghost of one of those children. What do you think? Do you believe the paranormal investigators or is there some other explanation for this image? There’s very little information available about this photograph. 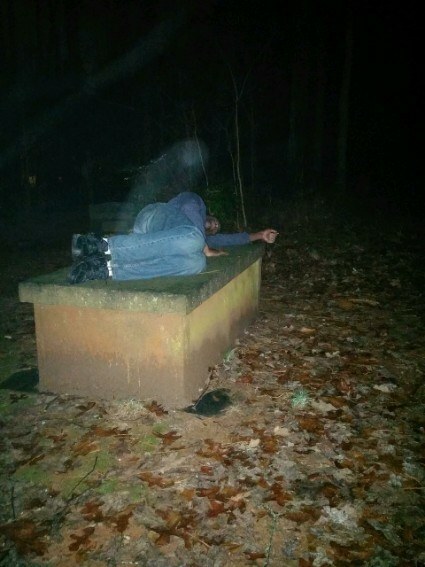 This anonymous family decided to take some random snaps late at night in an unknown cemetery but could never have imagined the frightening image that would develop. While walking through the graveyard the family were hoping to photograph something spooky. The family claims there was only three people present in this picture when it was taken: the two ladies, one in the red vest, the other in the pink sweater and the man in the white top. The grey walking figure is completely unaccounted for. When the photo was shared to social media, it sparked a fierce debate about what the figure could be. The majority of comments said it had to be a ghost. The shape and posture, the translucent grey tone all lead to paranormal conclusions. However, some skeptics noted the poor quality of the photo and thought it might be an effect caused by the flash of the camera. Whatever the case may be, there is something genuinely eerie about this photo. 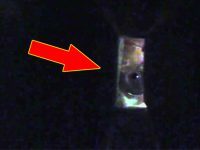 In 2013, a Texas paramedic was walking down Essman Lane near the Mueschke Cemetery in Houston when he saw something truly chilling. The paramedic said he and his partner were parked in the lane in their ambulance when they noticed a strange tall creature lurking in the trees. The two men got out of the vehicle but found it hard to see anything in the dark. They heard a shuffling and twigs snapping. They claim they could see the faint outline of a ‘human sized’ creature with glowing eyes. A picture was taken and this is what they captured. In the photo you can indeed see a pair of luminous, golden eyes peering right at the camera. The eyes appear high enough to belong to a person or creature that’s around six feet tall. When the image was posted to social media, several commenters chimed in with separate accounts of creepy events occurring along Essman Lane near the cemetery. They claimed there’s been mysterious lights spotted floating in the woods, weird creatures have been seen and even patrons of a nearby fetish club often occupy the woods for some seedy dealings. 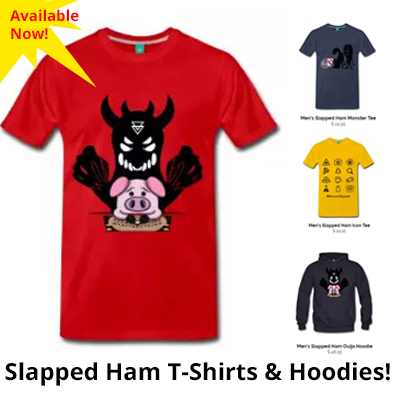 Several users responded to the final comment, noting that humans don’t have the tapetum lucidum reflector system in their eyes like most vertebrates do, so the reflection on the eyes couldn’t be a person lurking in the woods. Mueschke Cemetery has long held the reputation of being haunted. It’s been a popular research area for paranormal investigators for years. 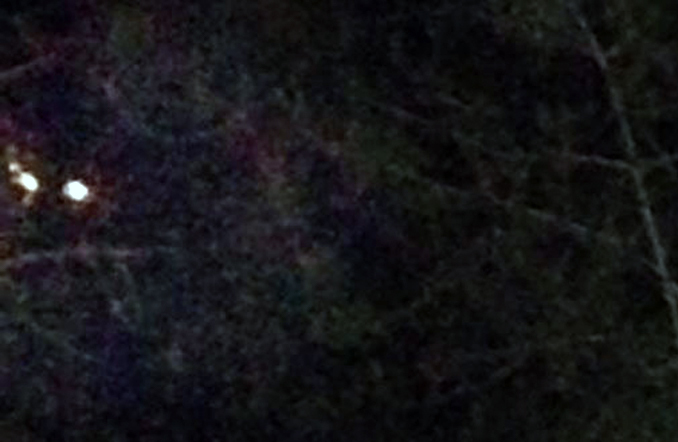 One such ghost hunter claims that he saw a fully visible specter floating among some bushes. He swears that moments later it was as if the forest came alive and started to grab at him. Have these two paramedics captured proof of strange happenings in this old cemetery? What do you think those eyes belong to? 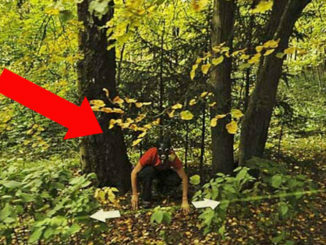 When they reviewed the photo the next day they were dumbfounded at what they saw. There just above the uncle is a white presence of some kind. It looks as though it’s leaning over the man. Allegedly, the tombstone dates back to the American Revolution. This photo taken sometime between the late 1960’s and early 1970’s was captured in the Highgate Cemetery, London. The dark, robed figure in the center of the image is believed by many to be a ‘king vampire of the undead’, said to have been a Romanian nobleman bought to London by his devoted followers. In 1970, sightings of the vampire grew. On Friday 13th, March, two men, Seán Manchester and David Farrant vowed to find and destroy the evil creature. The media reported the story and within 2 hours a mob of hunters from all over London began swarming over the locked gates of the cemetery to confront the beast. Manchester claimed that he lead a group to one particular catacomb where they managed to climb inside through a hole in the roof. He said that they opened several coffins and placed garlic and holy water inside. Some months later, the charred and headless corpse of a woman was found near the catacomb that Manchester said he had entered. Farrant was arrested soon after in the churchyard next to Highgate Cemetery carrying a crucifix and a wooden stake. Shortly after Farrant was arrested, Manchester and his group returned to the cemetery. This time they forced open the doors to another family vault where they believed the coffin of the vampire had been moved to. Just as Manchester was about to stake the body inside, he was persuaded to leave the vault by several members of the group. 3 years later, Manchester claimed he again encountered the same corpse. This time is was in the cellar of an abandoned house in the Highgate area. Believing that it had to be the vampire he was searching for, he staked and burned the body. 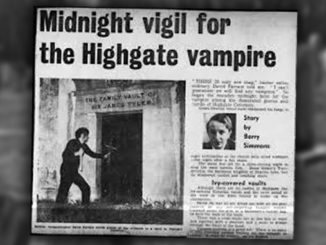 While mysterious sightings are still reported at the Highgate Cemetery to this day, no one knows for sure if the ‘king vampire of the undead’ still lurks within the grounds. Was this cemetery actually home to a real vampire? Was the beast destroyed or could it still lie waiting in a sinister slumber, soon to awake and take its next victim? This is another classic ghost photo that has puzzled experts for decades. 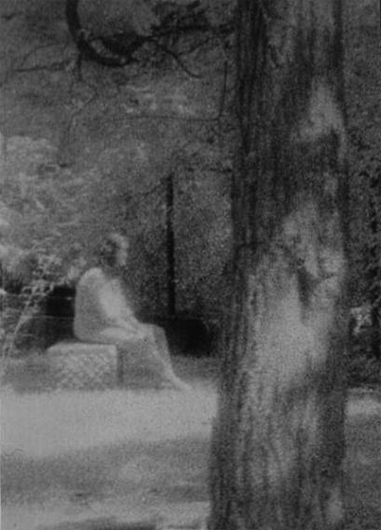 In the old greyscale photo you can see what looks to be a partly translucent woman, sitting on a stone bench. The photographer claims no one was in the shot when the photo was taken. This famous image was taken back in 1991. A paranormal investigation group known as the Ghost Research Society (GRS) were exploring Bachelor’s Grove Cemetery, an abandoned graveyard on the fringe of Rubio Woods Forest Preserve, Illinois. The group were prompted by over 100 reports of supernatural activity taking place on the property. Everything from glowing orbs and disembodied cries to full apparition manifestations. GRS member, Mari Huff, was taking photos with a high-speed infrared camera in an area particularly known for strange events. No one was on the property at the time, except for the GRS team, yet one of the photos turned up, what they believe, to be a full-bodied specter. The alleged phantasm is wearing old fashioned clothing and their demeanor appears to be somber with hunched shoulders. Could this photo be a genuine glimpse of a spirit or ghost? Love to hear your opinions on this one in the comments below. So there’s our look at some really creepy cemetery photos. Do you find graveyards scary? Yes, no? Love to hear your thoughts in the comments below or on any of our socials.